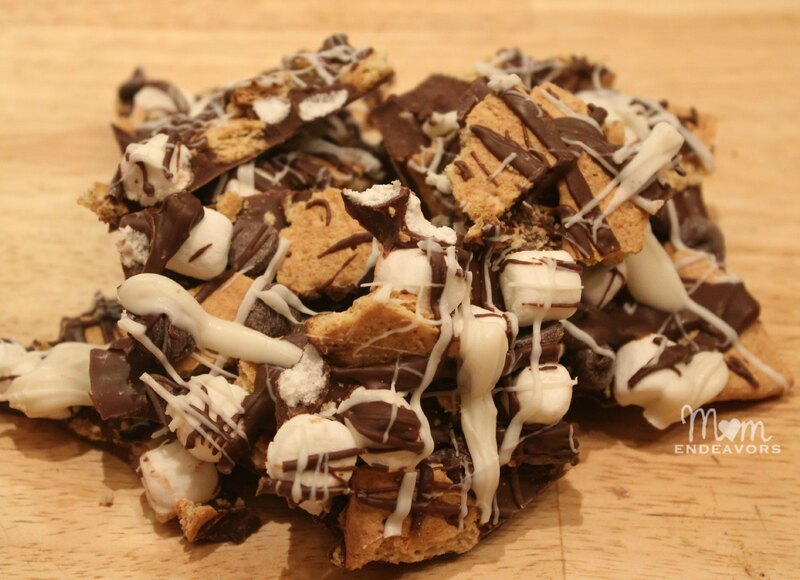 Easy double chocolate s’mores bark! 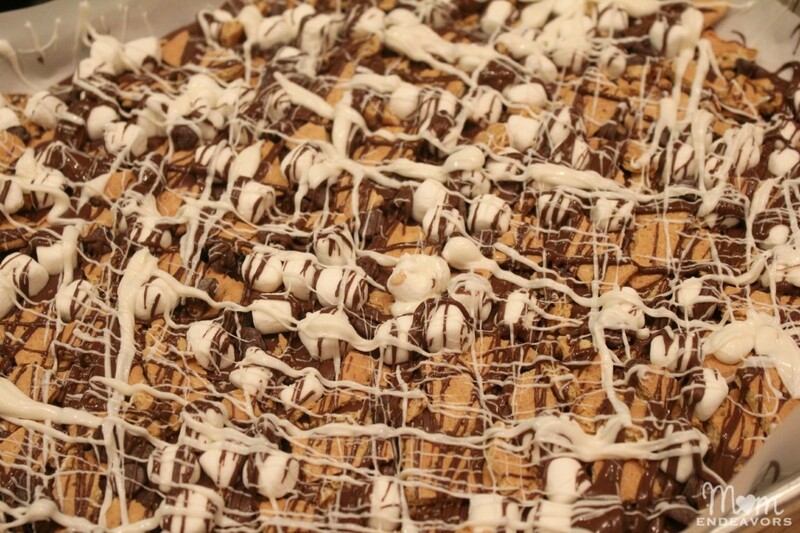 There were other posts planned for today, but this s’mores bark just couldn’t wait! After sharing this yummy treat with some family and friends, some people were rather eager for the recipe. 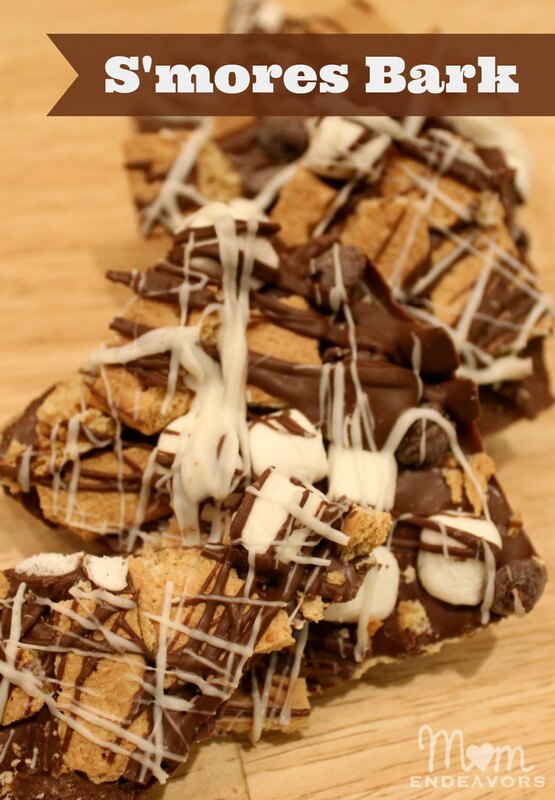 You could whip up a batch for this weekend, because seriously this double chocolate s’mores bark is SO easy to make!! Don’t let the chocolate drizzle fool you! The whole thing took me 10 minutes to whip up, making this “fancy” double chocolate s’mores bark the perfect summer treat to whip up to bring to a gathering. No heating up the oven, no need for a campfire, and very little time involved! 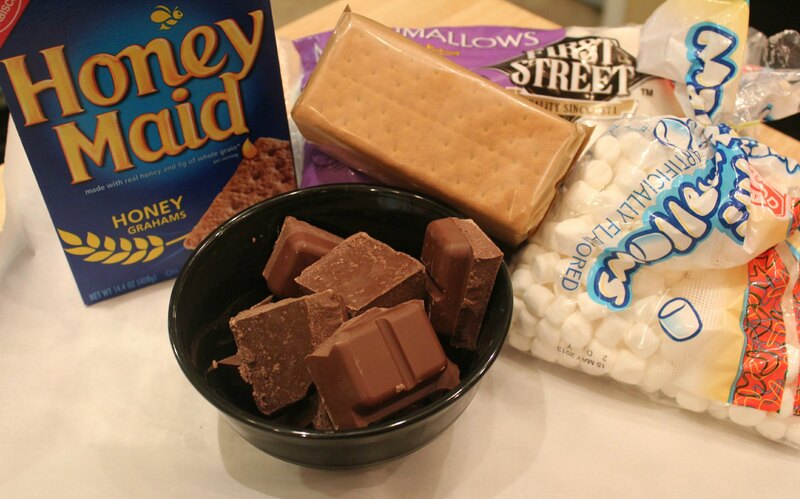 Just start with your basic s’mores ingredients. You really probably could use just about any chocolate you like. But, I like the way the chocolate candy coating melts & hardens, so I used that. For one cookie sheet full, you’ll want approximately 12oz- 1lb of chocolate, one sleeve of graham crackers, and a few handfuls of mini marshmallows. To make it a little “fancy” looking and “double chocolate”, add some chocolate chips and some chocolate drizzle. You’ll need white chocolate or vanilla candy coating for the white drizzle. To get started, cover a cookie sheet with a piece of parchment paper. Then, melt the chocolate in the microwave. For a full bowl, I do one full minute. Then, stir and add 15 second increments as needed. 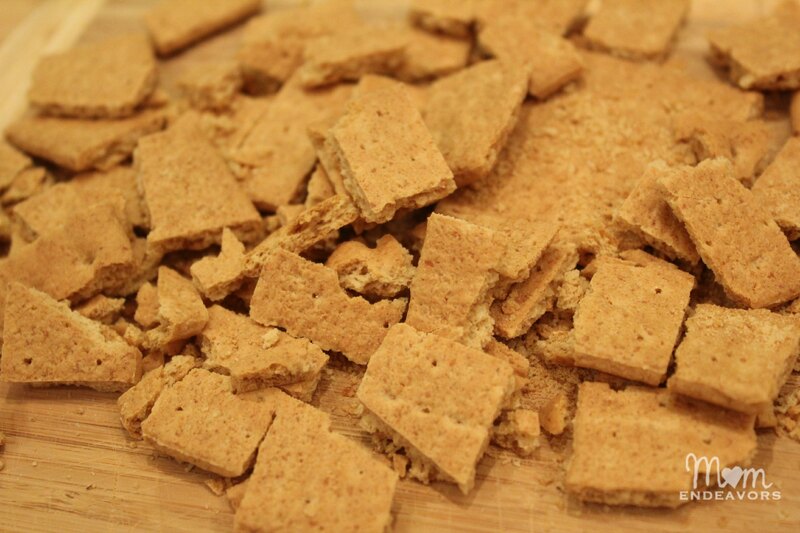 While the chocolate melts, chop up your graham crackers. Then, once the chocolate is melted, pour onto the parchment. 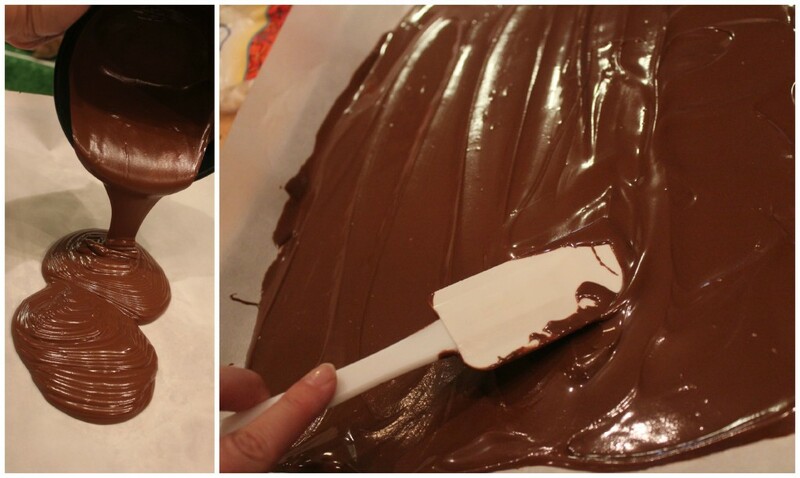 Use a spatula to spread the chocolate over the whole parchment-lined cookie sheet. You want a thin layer of chocolate, but not so thin that it is just going to fall apart. As soon as you have the chocolate spread out, sprinkle the chopped graham crackers and handfuls of mini marshmallows over all the chocolate. For some added chocolate (and to fill in little spaces), I added a handful of chocolate chips as well! Once all those goodies are on the melted chocolate, I lightly pressed down over the top to help make sure everything was actually touching the melted chocolate (so it would all stick together). Then, put in the fridge to harden quickly. At this point, you could stop here. But, I thought it would look a little fancier with some chocolate drizzle. Plus, I thought it actually might help any loose pieces stick a bit better. So, while that was in the fridge, I melted down just a bit of white chocolate and milk chocolate candy coating to do some drizzle. Once that’s melted, just use a spoon to add some fun pizzazz over the top of the whole thing. Let that harden. Then break into pieces and enjoy! What’s your favorite way to eat s’mores? 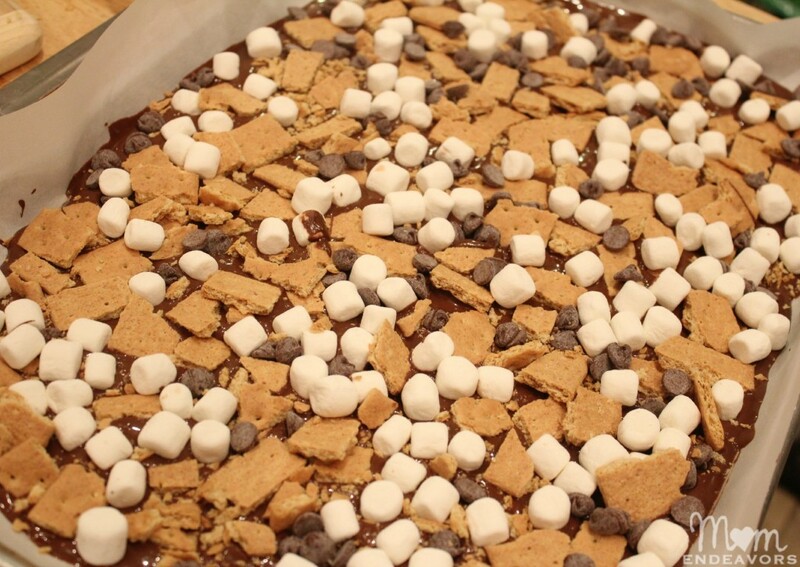 *For more delicious s’more recipes, be sure to check out this post —> 35+ Amazing S’more Recipes! This looks AMAZING! I have everything except the chocolate bars already…headed to the store now! Mmmmmm, perfect for this time of year! These look great! Wow – this looks SO good! Definitely pinning for later. Visiting from Craft-O-Maniac link party.